iPad Can we take the time to appreciate the battery in this thing? Discussion in 'iPad' started by fel10, Jan 4, 2014. I've been playing games, listening to Spotify and doing a lot of browsing, and I haven't charged my iPad in almost a week. This is amazing. I hope apple can make a battery for next gen's iPhone as amazing as this one. I agree. The battery life is excellent. I charge my iPad every other day. It's awesome. People are so busy complaining about the iPhone battery they don't see the iPads battery. Definitely agree!!! 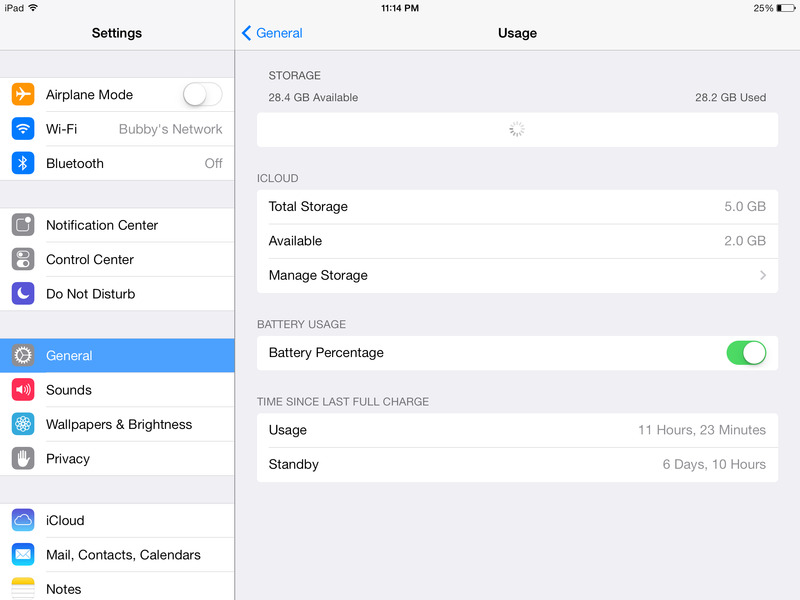 The best I've had was 13 hours usage on my ipad mini retina much better than expected!!! My rMini is the first device I've had in years that I didn't have to charge every single day. It really is incredible that even with moderate to heavy usage, I still only have to charge it twice a week. You must use your phone pretty heavily if it doesn't last a day. My 5s usually gets over 9 hours of use plus up to 2 days of stand by on a full charge, but usage for me is usually just some web surfing, youtube, texting, and quick calls. My rMini lasts me an entire day. Which is excellent. But my iPhone 5 needs a charge in the middle of the day and a religious nightly charge. I am a heavy phone user and data pig at about 12 gig a month. I can get 2 days of use on my Air since I now split the usage with the rMini. The 5S battery is no comparison to the ipad no way. With my ipad present I can make my phone finish the day with about 10%, since my ipad has been repaired for the last 2 weeks it's required charging twice a day from the extra use! Many modern Android flagships last a full day of moderate usage. Which ones? The rMini and rAir has been specifically praised for its battery life through the tech community. Have not seen this for any android device. If there is one area that apple has down to perfection it's the battery in these iPads. Whatever they are doing....keep doing it! Well the Galaxy note 2 and 3 are reported to have excellent battery lives. In my own experience only the S4 has a decent/good battery life out of all the Android devices I've used. However even the s4 cannot hold a candle to the battery life on my iPad mini. Even with heavy usage I get at least 2 days from a single charge. I often get a week on a charge. Another impressive thing is that it only has minimal discharge when in standby. I often have no battery discharge over night. On my Android devices I have at least 10 % battery loss overnight, sometimes it can be up to 30 %. I am still amazed at my rMini battery. It handled a full day (7 hours) of my 6 year-old using it for games and videos, and then another 3 hours of my use writing music. It was still 29% when I decided to charge it up. I am consistently amazed at how long I can have it in standy and then heavy usage before needing to charge it again. One of the best things about the new iPads. I have read a lot of threads where people claim an incredible 15+ hr battery life. I am getting quite a bit less with about 10-12 hrs moderate usage. Brightness around 40%, cellular turned off, wifi on, most other things switched off like Bluetooth and app refresh. I mainly web browse with a little light gaming here and there. I think the only way I could bet extremely high hours is by mainly streaming radio with the screen turned off. I depleted my once a month and recharge at bwt 10-20% in normal use. This also help battery juice longer. I can't help but smirk when I hear people say, "I hope Apple can make a battery for iPhone that's as good as iPad". The reason the iPad has better battery life is because it's a substantially larger physical device so has a physically larger battery. Bigger battery equals more battery life. The iPhone is a smaller device with a smaller battery, which means less battery life. Apple excels with battery life. I'm thrilled with the battery life on my air so far. I'm getting anywhere from 15-20 hours of usage time and 10-15 days between charges. I've been charging at about 10-15%. My normal usage is about 1-2 hours per day of web browsing, reading, email etc. it burns a bit faster if I do any gaming or lots of photo editing. GarageBand also drains it more rapidly but still, the overall times seem to hold true. Users who just use their iPads for casual tasks will certainly see the high end of my battery experience.